Could the Windrush Scandal Happen in France? 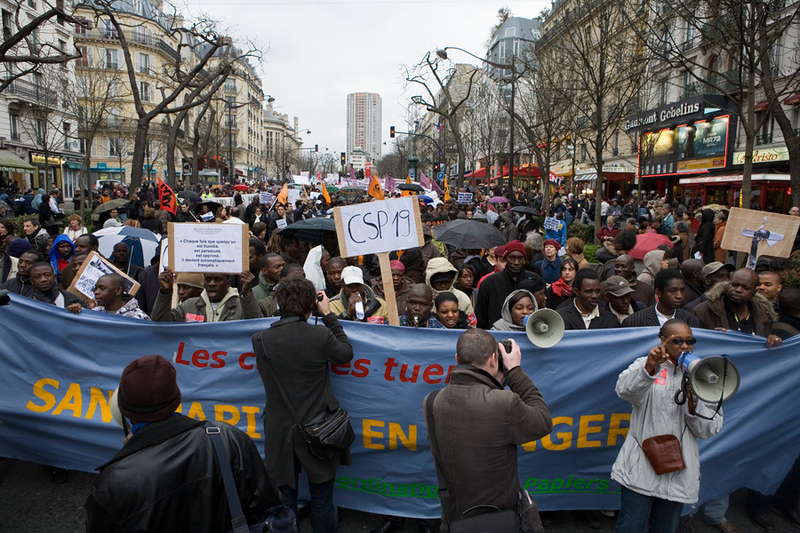 A 2008 protest in Paris against France’s immigration laws (Photo: looking4poetry, Flickr). The Windrush crisis continues to have grave implications for the British citizens of Caribbean descent denied their rights to housing, healthcare, and employment. It also continues to have repercussions for the United Kingdom as a whole, including last month’s resignation of Home Secretary Amber Rudd. June 22, 2018, marks the seventieth anniversary of the first wave of Windrush Generation arrivals. As Britain seeks to define what rights its citizens of Caribbean descent will have in the “hostile environment” created by increasingly isolationist policies, it is clear that the geographic scope of this conversation is not limited to the U.K. Neighboring France shares a similar history of immigration policies in the postwar period that facilitated the migration of workers from the Caribbean to rebuild a postwar Europe. Like Britain, France has steadily moved towards increasingly restrictive immigration laws. As French citizens of Caribbean and African descent, who often find their own citizenship contested, watch the Windrush scandal unfold the similarities in the two countries’ immigration histories raise the question: Could this happen in France? There are many similarities between France’s and Britain’s immigration histories. Between 1963 and 1982, the French government sponsored the migration of people from its overseas departments to the metropole. This migration occurred under the auspices of the Bureau pour le développement des migrations dans les départements d’outre-mer (BUMIDOM), translated as the Office for the Development of Migrations in the Overseas Departments. The BUMIDOM years overlap to a degree with the Windrush years and represent a period when European countries, needing a boost in their labor force, turned to their (former) colonies. Those who migrated from the Caribbean to France were drawn by BUMIDOM’s lofty promises of upward socio-economic mobility. The program fell vastly short of these promises and French Antilleans found themselves in low-wage public sector jobs and substandard housing. The BUMIDOM project quickly became another moment that put France’s definition of citizenship to the test. The Antilleans who moved to France to seek a better life were French citizens, and had been so since the law of departmentalization was passed in 1946 and took effect in 1948. Yet in the metropole the second-class nature of that citizenship, at least as perceived by the French government, became rapidly apparent. French Antilleans were often subjected to the same racism as African immigrants for example, a stark reminder that citizenship on paper did not always guarantee equal rights and treatment. The memory of BUMIDOM today is a story of trauma and humiliation for many of those who participated in it. It remains an episode that many would rather forget. It is inconceivable, for example, that the proposition to issue a Windrush stamp in the U. K. would find echoes in France. In the U. K. a parliamentary motion was tabled to recognize the contributions of the Windrush generation by commemorating the seventieth anniversary of their first arrival this June, while in France BUMIDOM remains shrouded in silence. That silence is only now starting to be broken in public discourse through film and radio documentaries. BUMIDOM is not celebrated or publicly memorialized in France because, at least for some of the Antilleans who lived the experience firsthand, it was a painful reminder that their citizenship remained contested. If history reveals the conditions that created disparities in French citizenship, it also teaches us that African and Caribbean people have long resisted European governments’ attempts to diminish their citizenship rights. Two years before the HMT Empire Windrush brought its first Caribbean passengers to the U. K. in 1948, Black French politicians who were negotiating the terms of citizenship for themselves and generations of Africans and Antilleans to come sounded the alarm about the potential for a crisis such as the one we are witnessing today. Black women legislators such as Gerty Archimède from Guadeloupe and Eugénie Éboué-Tell from French Guiana, knew that the transition from colonial subject to citizen meant that a passport could not magically wave away the centuries of racism and oppression that had created a racial hierarchy in which people from the Caribbean and Africa would be perceived as second class citizens. For all their similarities and differences, this is precisely where BUMIDOM and the Windrush scandal converge: the ongoing entanglement of citizenship and empire. The Windrush scandal goes far beyond a simple inability to meet the burden of proof for citizenship. It points to a deeper problem of equating citizenship with paperwork as defined by the state rather than with one’s belonging and contributions through employment, community ties, and paying taxes as defined by the Windrush generation. The scandal highlights the problem of shifting goalposts in Britain’s steady march towards more racially and geographically homogenous criteria for who is considered a citizen until proven otherwise. France, too, continues to move towards more restrictive notions of belonging as state officials vilify Islam as a threat to national identity and characterize people of Arab and African descent as a burden on state welfare. The reality of no longer being able to meet the criteria for French citizenship, whether legally or in public opinion, is very real for the Antilleans who appear to be unscathed by the hot button immigration debates in France for now. The Martinican thinker Frantz Fanon issued a call to his compatriots to not be lulled into complacency if xenophobic rhetoric did not name them directly. As he wrote in Black Skin, White Masks, “It was my philosophy teacher from the Antilles who reminded me one day: ‘When you hear someone insulting the Jews, pay attention; he is talking about you.” That call resonates today as the Windrush scandal unfolds across the Channel. If a similar scandal ever erupts in France, it will most certainly look different, taking on the specific contours of France’s national narrative about universalism and a supposedly colorblind Republic. But it will have as its cause the very same phenomenon that Black French legislators like Éboué-Tell warned against over seventy years ago: a limited, exclusionary definition of citizenship that betrays its colonial roots. Thank you for this informative and insightful article.